I started coming down with a bad cold yesterday:( My head felt like a drum was beating inside, and my nose like a big balloon! I hate it when I am sick! The only thing that was on my mind on my way home from the office was that I needed Freekeh Soup. It is so good, especially when you are down with a cold. Freekeh which is smoked green wheat or green wheat, is a common dish in Jordan. Check Wikipedia for info on how it is processed and prepared. In the market, you can find two types of Freekeh; the whole grain one used in dishes in place of rice (check my Freekeh Recipe), and the fine or crushed Freekeh used in soups. 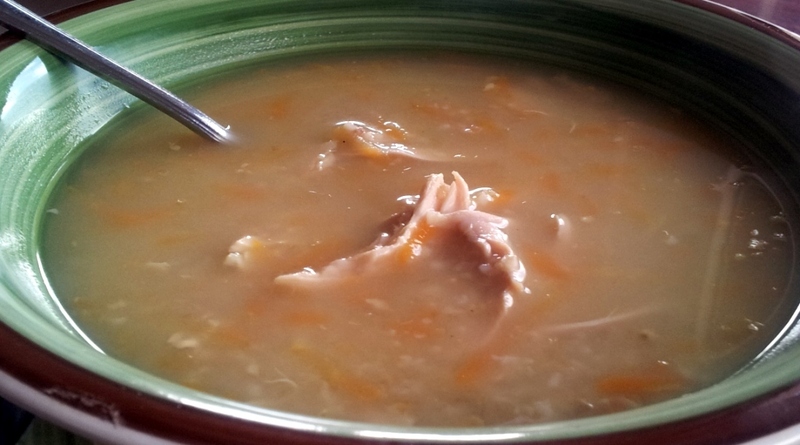 Freekeh soup is very simple to make and is very healthy, as Freekeh is whole grains. It is also comforting on cold days or when you are down with a flu! My daughters loves this soup so much and are ready to eat it for lunch and dinner for several days. I usually make a large portion of Freekeh Soup to last 2-3 days and still hear complains when it is finished! Place all the ingredients for preparing the chicken in a pan, add water to cover the chicken and at least 3-4 centimeters more. You need a lot of stock. Cook, covered, over medium heat until chicken is tender. Remove the chicken from the water and leave on a tray to cool. 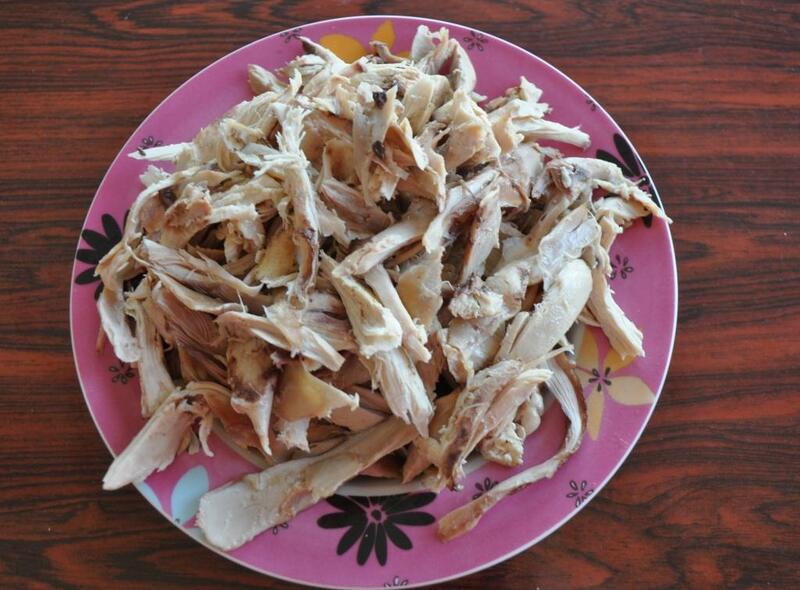 While still warm (easier to handle), remove all the skin and bones. 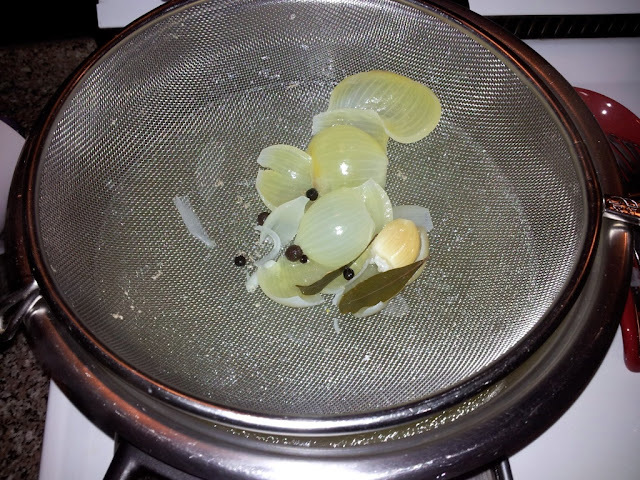 Pass the chicken stock through a sieve into the pan you will use to prepare the soup. You should have around 12-14 cups of chicken stock. Add the chicken pieces, grated carrots and the freekeh. Boil until Freekeh is done; about 20 minutes. If you want the Freekeh Soup to be more watery, add some water. Taste and, if needed, season with additional salt and black pepper . 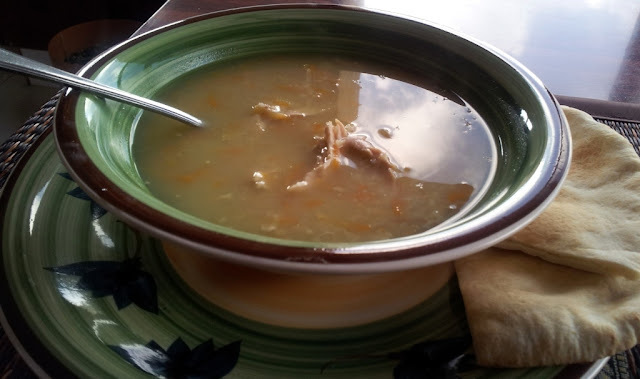 Hope you enjoyed today's easy recipe: Freekeh - Smoked Green Wheat - Soup Recipe. Bon appetite. Really awesome!!!! Healthy and delicious,my children as well as my husband who is on deit likes it! Thanks Sadianaiman for your feed back:) I am glad you enjoyed it, it is one of our favorites!